Rolling Meadows Police Narcan Honor at City Hall. Civilians and firefighter/paramedics and a police officer were honored for two recent medical calls in Rolling Meadows. In each case a life was saved. While Rolling Meadows police were responding, the woman collapsed in a toy aisle at the Meijer store. She had no pulse and no respiration. Rolling Meadows Police Officer Geunyoung Pak administered a Narcan injection in the woman’s thigh when he believed the woman had possibly overdosed on heroin or another opiate. Rolling Meadows Fire Department honors for CPR/AED save. On March 14, 2017 about 10:30 p.m. Dan Isola was playing hockey at the Nelson Sports Complex Ice Arena, and skated over to the bench, stopped breathing and collapsed with cardiac arrest. Two citizens went to work performing CPR and administering treatment with an AED (Automatic External Defribillator) to save Isola’s life. 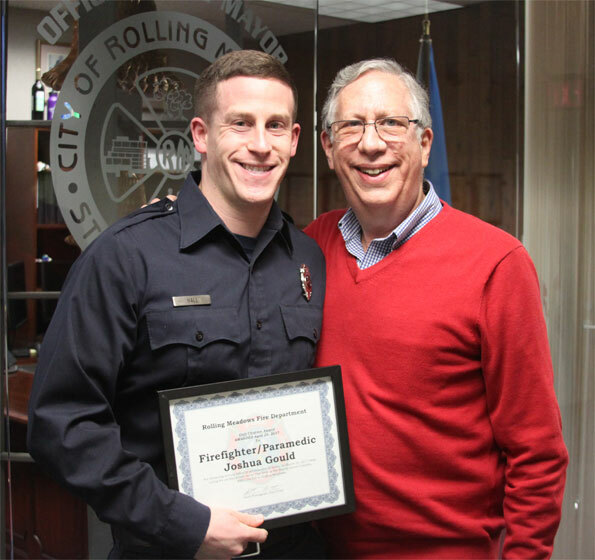 Rolling Meadows Fire Department determined the two citizens were instrumental in saving Dan Isola’s life — Rolling Meadows resident and Elgin Fire Department Lt. Wayne Smith Rolling Meadows Park District’s Stephan Polus, on the Youth Hockey staff. Rolling Meadows Fire Chief Scott Franzgrote, who presented the honors, explained the importance of the initial response of CPR/AED-trained citizens and the response of firefighter/paramedics capable of Advanced Life Support. Joshua Gould is the son of Arlington Heights resident Arlen Gould, a School District 21 board member, who has also served as an active civic leader with the Northgate Civic Association and the Arlington Heights Festival Committee. The proud father has also served as campaign manager for several local government leaders. Firefighter/Paramedic Joshua Gould and Arlen Gould.